Spain’s Iker Martinez matched the achievement of one of the Volvo Ocean Race greats on Saturday when he became the first skipper in 22 years to win three legs in a row. 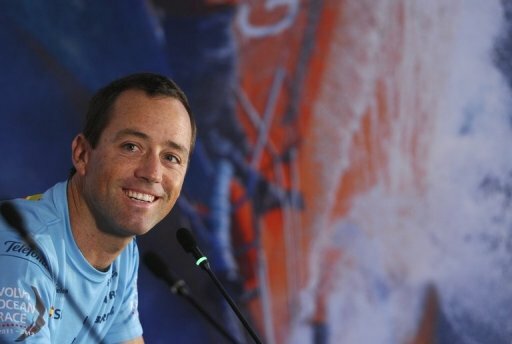 The 2011 World Sailor of the Year steered his Team Telefonica boat to a handsome 90-minute victory to claim his hat-trick triumph in the leg from Abu Dhabi to Sanya in Hainan Province, southern China. The last boat to win three legs running was Steinlager 2 in 1989-90, which was skippered by New Zealander Peter Blake and went on to claim overall victory in that edition. The leg, contested over the last three weeks, was split into two stages after being accompanied by armed ship for some of the way because of the threat of pirates. Martinez and his 10-strong crew were cheered home by a huge crowd on the dock on Saturday. The Spaniard, whose boat finished in 12 days 19 hours and 58 minutes, said afterwards he had not realised his crew had matched the late Blake’s achievement. "I didn’t know that but for sure we’re feeling great. We’re very happy, it’s a dream, you always dream to start a race like this. I just hope everything is going to keep going smooth," he said. The win had looked unlikely shortly after Telefonica left the Maldives on January 23. The boat suffered a split in a key sail and lost considerable ground on their rivals. But Martinez and his canny navigator Andrew Cape outsmarted the rest of the six-strong fleet through the treacherous Malacca Strait on the way to Vietnam. "I think it was by far the most dangerous leg I’ve ever done in a boat," said Martinez. The win takes Telefonica to 95 points at the top of the standings, with French campaigners Groupama, second in the leg, in third on 75 points. Camper (Spain/New Zealand) are second overall. The 39,000-nautical mile Race is held over nine months and visits five continents and four oceans. It is scheduled to finish in Galway, Ireland in July.